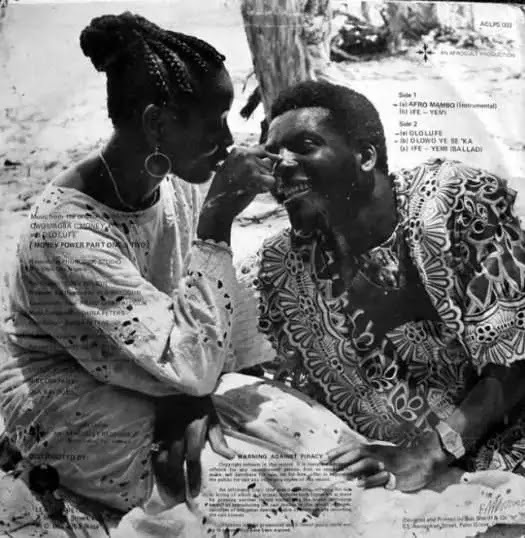 Nigerian pop culture has documented some storied relationships. We have seen good, bad, questionable, awwnnn, comical, wild and arcane stories that would send the average, uninformed Nigerian launching abuses at millennials again for their wanton lack of responsbility. On this list, we have Yoruba demons, pedophilia, meddling, young love, drug use and phony interviews. Sadly, the list also includes a generation xers, so 2/4 = 2 = everyone is guilty – relationship problems have no favourite generation. These relationships also set precedents and created It loves everybody. The sad turn outs of certain vaunted relationships also leave a bitter taste in the mouth and offer a gentle thought of what might have been. The Yoruba demon and the teenager – if it had been the modern day, Twitter would have bashed the sir. The relationship testified to how wrongness of particular actions could only be affirmed by time. An affair, or a fling — depending on who you believe. She was a young actress, he was a continental Superstar and juju music exponent, serially churning out hits. In an interview with Nigerian Films and according to Clarion Chukwura, they met on the set of Money Power and it began. According to some reliable old guys, Clarion was a dime back in the day, and Sir Shina Peters definitely scored big on this one. However, the fissure in a relationship with his son over the years caused some media and heated exchanges, in part aided by journalists in need of stories. The age issues might have also been a problem. Did I hear you say pedophilia? You said it, I didn’t. But this one, we call A WIN. The fling produced about ace Music Video Director, Clarence A. Peters. Without him, maybe General Pype wouldn’t even have had the short-lived career he had. T.W.O, as they are fondly referred to are an iconic couple, known for more than their “rich” appearance. A double act, they have transcended genres than Chris Okotie. Everytime you see them on TV, they are laughing. In their case, they at least didn’t pee the mattress like Okotie has – on several occasion. The idea of young love is fading as unfaithfulness has become a stark truth, people are proud of these days. Word has it that they met as undergraduates at The University of Lagos, where both were members of the band Turning Point. They might flaunt their relationship like Davido, but theirs is a testament to how high profile marriages can last in this ‘dog eat dog’ world. No scandal, no media onslaughts. Nothing. Just good vibes and great albums — first in 1999 and the latest in 2015. We call this one A WIN. The supposed, later debunked media friendly love triangle. Arguably the most dramatic relationship Nigerian music has ever seen. Who could forget the hour long recording, released by Ruggedman in 2009? According to Toni’s interview with Gistmania in 2011, Toni met 9ice in 2006 at Gbenga Adeyinka’s anniversary and even then, she had been living in America. He had then just released his first album, Little Money under Coded Tunes and they later stayed together in her Ikorodu apartment with Jahbless. They got married in 2008 and a Child, Zion was born. Shortly after, 2009–2012 media claims word from ‘the 9ice grapevine’ had it that Toni was cheating, reportedly with Rugged — which Rugged sought to clear with that infamous recording where 9ice’s noncommittal was palpable. According to the same Gistmania interview however, 9ice was having a relationship with Vicky Godis which later resulted in a set of twins, crashing his marriage to Toni. She also intimated his parents never liked her and his manager, fed the public a spin about an affair with Ruggedman, who was like a brother to her. The last we heard of it was on Don’t Go from 9ice album, Tradition. According to Pulse on January 22, 2016, 9ice vehemently disproved in a 2016 statement to Vanguard. They have since divorced with Toni remarried. It was the height of ugliness of a union, ended by rumours, dishonesty and meddling. Most importantly, a lesson as the spiral was excessive public knowledge. We tag this one ARCANE. Keep your drama from the public eye, else you become meal for mainstream media. Another one that played directly into the hands of ugly media spins and incredible degeneration. Empress and Timaya dated in 2008 after meeting at a Tuface party, but their break up stories were terrible. According to Vanguard Nigeria, at some point, Timaya was arrested by members of The Nigerian Police after he broke into a Church Praise Resurrection Ministries on a Sunday to demand keys to a car he had bought her. They have recently been publicised to still retain a friendship, despite their storied relationship. We will tag this one UGLY. A fleeting relationship that intimated Wizkid’s forays into monogamy might not work for the moment. It probably also a confirmed of the suspicious words of Ayomide Tayo that, “monogamy is for poor people”. Wizkid is certainly not poor, so you can fill in the expletives. Wiz sang about Tania on his Sarz produced 2016 hit, Jaiye Jaiye, but it all went downhill from there. Most of us had forgotten about this relationship till Tania’s latest tweet or IG post that the grapevine speculated was targeted at Tiwa Savage whom she allegedly unfollowed. Story goes, they started their on again, off again relationship in 2011, but the public didn’t know much about it till 2013 at the launch of Banky W’s album R&BW. After this reveal, the scrutiny and attention made Britney Spears’s 2000s media scrutiny jealous. During this ‘run’, Wizkid sensationally posted that he was single, while still dating Tania around 2015, and he got some bashing that led to him deleting his account –though he later claimed he had been hacked. Despite releasing a statement in 2016 that Tania broke up with Wizkid, everyone must have seen it coming — Baba Nla had fathered two Children by Sola Ogudugu and Binta Diallo. Even though money and reps will see most public relationships through, Tania might have been able to withstand one lovechild, but 2 probably got too much. The public did love this story while it lasted. So we tag it MIXED. Ah. First off, the age difference got attention. The press painted for them, a picture of Queen Mother and Gold digger. In the 2000s, Ure, a seeming better accomplished woman and reportedly older — a report Soul E quashed with Encomium weekly in 2014. Soul E was a fast rising singer with Colossal Entertainment. Ure was richer and Soul was a hustler, and the pressure of patriarchy automatically meant society was averse to all the relationship portrayed. Of course, it all backfired. At one point, it was claimed Soul E ran away from her after some very public spats — of course, the press covered all and added gas to the furnace. Ure has since remarried. We tag this one BAD. The quintessential dramatic, Nigerian relationship of the modern era. Kenny was an upcoming singer from a privileged background, Eddy, a hustler had started popping with the erstwhile group, The Remedies. That immediately drew eyebrows that he was going to use her. There were also rumours that rap legend, Eedris Abdulkareem, a former member of The Remedies and fellow Kennis Music signee had dated Kenny before Eddy met her. Eddy meanwhile sensationally claimed in a 2007 interview with Nigeria Voice that Kenny fell in love with him at first sight — Hmmmm. He also claimed they got married a week after they met. They got married around 2000, but news of their divorce broke in 2007. Eddy alleged Kenny was sleeping around with whoever. But before then, we also caught whiff of Eddy’s alleged “movements” with Funke Kuti. It was fun while it lasted, but their children will definitely not feel good when they read about these things now. The press had fun, but I know it was never fun with the subjects. In 2015, Eddy however revealed they were still friends. Regardless, we tag this one UNFORTUNATE. No fuss. No drama. Just good vibes better than Tobi promised us at Big Brother Naija 2018 only to spend the first three weeks of the show attached to an aggressively demanding CeeCee. They reportedly got acquainted as secondary school levers — Bez at Loyola Jesuit and Bolatito, at Olashore — during inter-school games. The reported nexus was Bolatito’s brother who introduced them much later. They got married 3 years later in 2014 and since then, it’s been good vibes. They welcomed a son in 2016. Anytime this relationship comes up in the media, you always see the cliché “goals”. We tag this one GREAT. First off, we must commend Tiwa for that scarf-wearing, no makeup master-stroke video interview in 2016. Applause, anyone? The relationship had some questionable start. Teebillz reportedly even spent her money and defrauded her. It was the scoop of scoops and an insight into how fast things could go sour in showbiz. They reportedly met in London while Tee was her manager. Together, they moved to Nigeria to launch her career. Business slowly turned personal as love knows no bounds and they gave it a try. They got married in an extravagant affair in 2013 — with one leg held in Dubai. Suddenly, we woke up to Mr Billz’s 2016 rant, accusing his wife of infidelity with a string of industry “men”. Ahhhhh. These “men” had to start doing shalaye — explaining what, where and how they were not involved. The truth remains in distant Mars of their minds sha. That culminated in that interview where she narrated her ordeal. Definitely, she was a victim, but her ways of reveal were; well, extraordinary. Nonetheless, the video was a hit and served its purpose — empathy was shown. In 2017, Lanre Odushola reportedly stepped in to help them salvage their relationship. It worked for a while till Tiwa Savage or Mr Billz allegedly filed for divorce earlier in 2018. Oh, he also attempted suicide somewhere in between all these. I’m just sorry for their son, Jamil. Mummy Jam Jam has however been killing it lately that Ciara decided to do Derico to her art. She and Teebillz apparently have also become friends one again. We tag this one UGLY. Like really OUUGLAII. “I like woman, I dey straightforward o.” Errm sir, please tell us something we don’t know. Reportedly, She was 16, he was 24. They met in FESTAC and he even accompanied her to her 16th birthday at a Beach. This storied relationship however took a suddenly different turn around 2004 when Tubaba launched a mega solo career to incredible success and critical acclaim. Of course, with that came women, attention and fanfare. Annie probably couldn’t deal with his stardom and the effects of his new status as Baba probably went off the rails, so it because on again, off again. Sandwiched between their tumescent episodes, Baba fathered 2 Children with Sunbo — whom he dated for 4 years. After Sunbo’s 2nd child, Annie had her first just before she stepped out of the picture OR she chose to be a side, side chick because Madam Pero, also had Children between those episodes. We however heard musings that Annie was always “The One” and this was confirmed when the engagement news broke. Reliable sources claim they were not even dating at the time, despite having a kid together. Tuface reportedly called her closest cousin and arranged a surprise party where he proposed AND she accepted. Annie later said Tubaba has called 2 months prior to apologize for all the wrongs he had done her — awwwnn. It’s been bliss since.